Hello Aspirants, As you know that Vocabulary is the cornerstone of your English skills. Without a strong vocabulary, you cannot implement the rules of English grammar. Memorizing vocabulary may not be your favorite activity, but we have tried to create plenty of ways to make it more fun. It will be helpful for upcoming exams like SSC, SBI PO,IBPS, RRB AND INSURANCE EXAMS. Hope you would like the post!!! We providing download e-pdf document 5000 Top Vocabulary words for Competitive Exams Download PDF Free. It will be very useful and accerlate in your vocabulary skills. 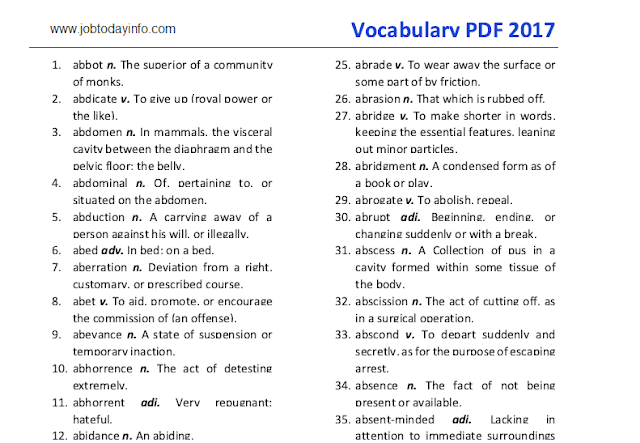 You are all advised to download English Vocabulary PDF free by through the given link. All the best.